Along M-22, across Betsie Lake from Frankfort, the small Village of Elberta is a pleasant destination to walk along sandy beaches, shop local stores, visit the farmer's market and check out the annual Elberta Solstice Festival. Elberta Waterfront Park: With 5.6 acres on the Bestie Bay shoreline, this park is a wonderful place to walk, have a picnic, and enjoy the outdoors. Elberta Dunes South Natural Area: With three quarters of the area classified as Critical Dune Area, the 56-acre area is really special to Elberta. It offers a 1.2 mile round trip trail of moderate difficulty. Elberta is another great place to experience kayaking, canoeing and paddle boarding on Betsie Lake and even along the shore of Lake Michigan. 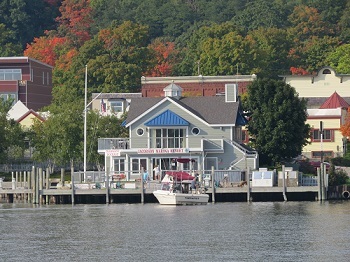 There are several marinas including Jacobson Marina and East Shore Marina in Frankfort, and Betsie Bay Marina in Elberta that dock sailboats and fishing boats on Betsie Lake. For those avid fishermen, Elberta also has a pier along the shore at Elberta Waterfront Park. 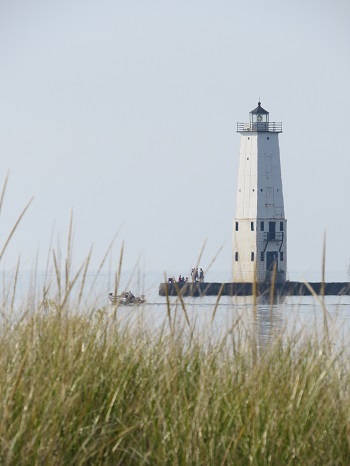 On calm days, people enjoy fishing from the north and south piers that reach out into Lake Michigan and at the mouth of Betsie Bay. If you want to explore the waters of Betsie Lake and Lake Michigan but don't own a boat, there are several charter fishing boats in the area. Betsie Bay is known for salmon, brown trout, steelhead, smallmouth bass and catfish. 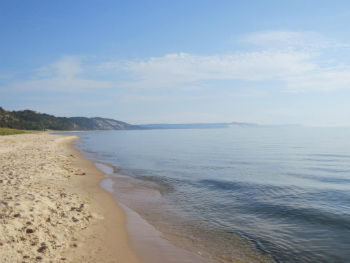 Elberta Beach on Bye Road is a peaceful spot with a long, sandy swimming beach on Lake Michigan. It's a great spot to watch the sunset over Lake Michigan, and compared to the Frankfort beach, it's not usually crowded. From here, you can see the Frankfort North Breakwater Lighthouse. 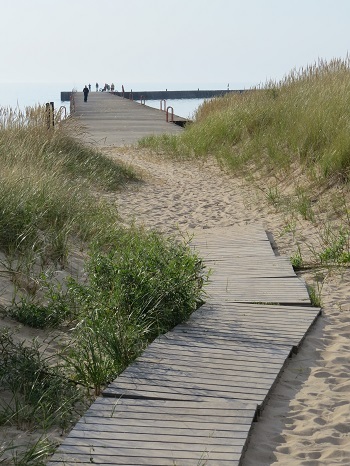 A short boardwalk on the north end of the beach connects to the southern pier at the mouth of Betsie Bay. The Elberta Waterfront Park on Short Street is a great spot to picnic, with gorgeous views of Betsie Lake and Frankfort. The well-maintained park on Betsie Bay features a large picnic shelter, playground, amphitheater, and a short walking path. The park also includes historical markers about the Life Saving Station and Ann Arbor Railroad. If you're a hiking, biking or jogging enthusiast, Frankfort and Elberta are included in the 22 mile long Betsie Valley that starts in Frankfort and ends in Thompsonville. The Frankfort to Elberta to Beulah route is about 8 miles long. There's also a short 1 mile route from Beulah to Benzonia, and a long, 13 mile unpaved route from Benzonia to Thompsonville, which is commonly used by snowmobilers in the winter months. Take a look at the Betsie Valley Trial map. Just before the very steep drive down to Elberta Beach, a scenic overlook is available off of Bye Road, and provides a gorgeous view of Lake Michigan, Elberta Beach and the Frankfort Lighthouse. Also read about the city of Frankfort, just 5 minutes from Elberta.